← European Office 365 datacenters exposed to U.S. authorities? I’ve been interested in the battles that flowed across France in both World Wars for many years. My interest was partially awakened by spending time close to the D-Day beaches in Normandy but I also had the chance to live with a French family in Verdun in 1973 for a number of weeks. The purpose for my French trip was a student exchange where I’d learn to speak passable French, but more importantly I recall happy memories of eating vast quantities of strawberries grown in the garden of Monsieur Perinel, swimming in the Meuse river, and many opportunities to poke around the battlefield where German and French armies had bled themselves dry in 1916 as they fought over landmarks such as the Fort de Douaumont, Fort de Vaux, and Mort-Hommes. The Ossuaire made a huge impression on me as did the many museums that held relics of the battle and those who had fought and died around Verdun. If you want to read about the battle, I suggest you try Alistair Horne’s The Price of Glory: Verdun 1916 , which provides a good overview of the strategic and tactical struggle that took place around the town. Aside from Verdun, northern France is full of battle sites, none of which is more emotive than the Somme. This year marks the 95th anniversary of the opening of the Battle of the Somme (1 July 1916) when the British and French armies attacked along a reasonably long front in an area of the front that was deemed to be “quiet”. The advance was preceded by a week’s artillery bombardment that was too light to do the necessary damage to the German dugouts or wire and the net result was a depressing loss of life for little gain in territory. Nevertheless, the Somme remains an interesting and provocative area to explore that I have visited several times over the years. On this occasion I wanted to walk some of the ground that the Ulster (36th) division had attacked on 1 July 1916 and visit some other interesting sites – the Somme is full of places to explore and I only had a day. My primary guide for exploration was Peter Barton’s amazing The Somme. There are tons of books that have been published about the Somme including my favorites Lyn MacDonald’s Somme and Martin Middlebrook’s The First Day on the Somme 1 July 1916, but Barton’s book contains many panoramas taken (with pretty basic photographic equipment) by the British Army from 1915 onward (when they took over the Somme sector from the French) in preparation for the advance that they hoped would win the war. The book also contains up-to-date pictures that broadly match the older panoramas and allow you to compare and contrast the landscape of today with the situation that faced the British tommies in 1916. Another, out-of-print, book that is a valuable resource is “Somme: Then and Now” (John Giles – ISBN 0-900913-41-X). Originally published in 1986 and reprinted three times since, this book contains a lot of photos taken in the 1970s and 1980s that allow you to compare the battleground of today with its state thirty or forty years ago. In particular, you can see how trees and other growth have covered more of the battlefield in that time. There are other books that are more specifically focused on providing details of walks that you can take through the battlefield sites. The best of these include Major and Mrs Holt’s Battlefield Guide to the Somme (nice expensive pocket book), Middlebook Guide to the Somme Battlefields (much bigger and more expensive), or Walking the Somme (a nice balance). If you don’t want to buy a specific guide book, there are other references available online, such as the BBC’s “Six stands in one day“. I prepared by visiting the Museum of the Great War in Peronne. There are other museums and collections of military hardware dotted around the Somme, notably the Somme 1916 museum in Albert. However, I find that the Peronne museum provides an excellent overview of the war and the pressures that were exerted on those who fought. Heading out of Peronne on July 1, my first stop was Delville Wood, which is close to Longueval village. 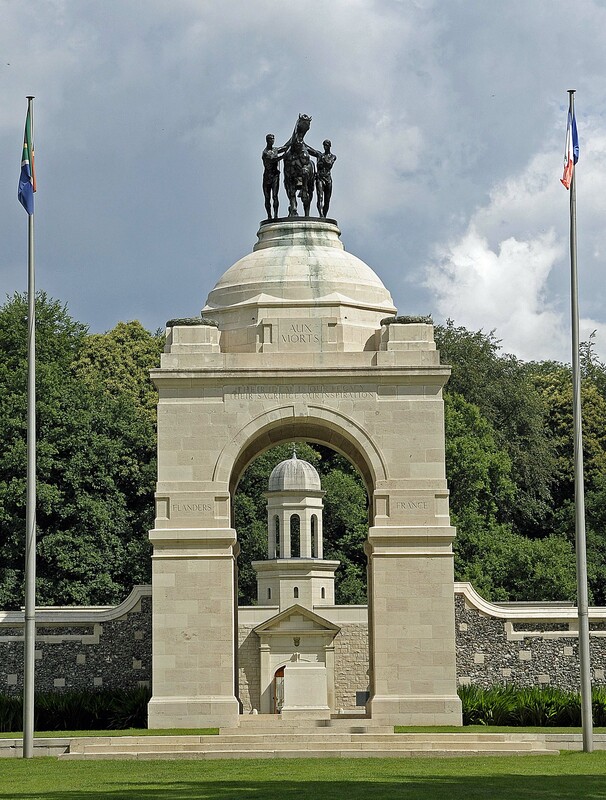 Delville Wood is the site of the South African national monument to those killed in both World Wars, chosen in part because of the enormous sacrifice of the South Africans in July 1916. At 3:25am on July 14, the South African infantry brigade attacked Delville Wood with 121 officers and 3,032 other ranks. 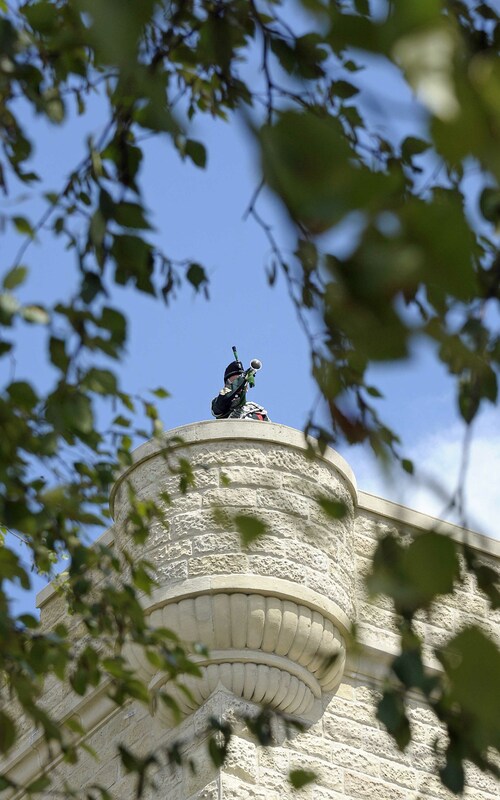 They were relieved during the evening of July 20 and numbered just 29 officers and 751 other ranks. 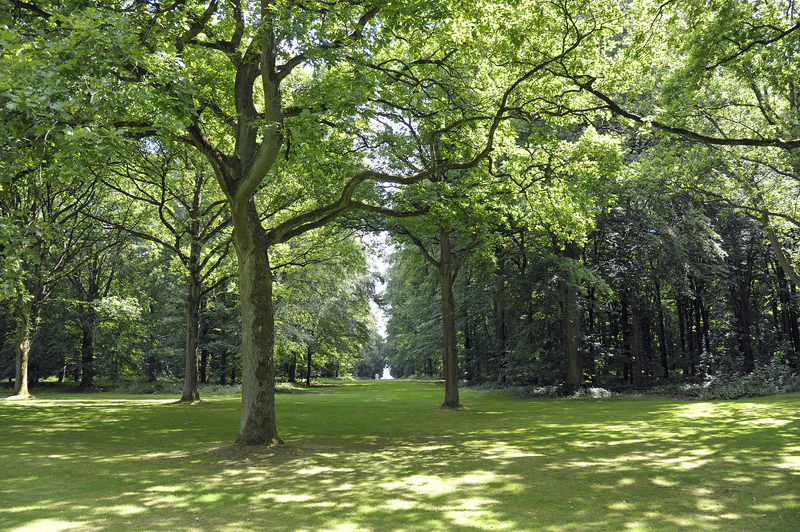 There are some preserved trenches in Delville Wood that wind their way through the trees. You can also see a Hornbeam tree, a survivor from the fighting whose trunk contains some shell fragments. From Delville Wood I headed through Longueval to High Wood to have a view of some of the other wood-dotted terrain that created natural blockages and obstacles for the Allied advance. In this part of France, woods resemble islands in a sea of crops and although there wasn’t much cultivation going on in 1916 the woods remained prominent features that were heavily defended and took much effort to overcome. The British started to attack High Wood on 14 July 1916 and only managed to overcome the stubborn German resistance two months later. Next stop was the Thiepval Memorial to both visit the memorial and to use the car park as a convenient departure point for my walk. 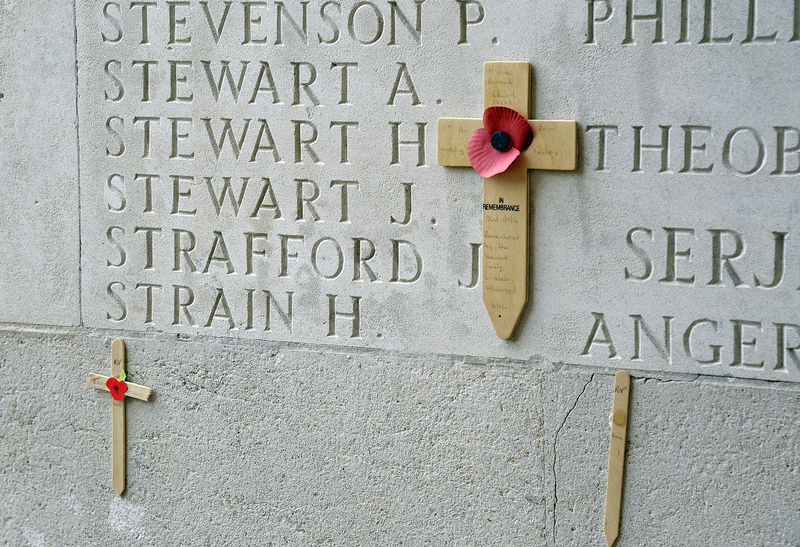 The memorial was designed by Sir Edwin Lutyens to commemorate the 72,192 missing British and Commonwealth men who fought on the Somme battlefields and have no known grave – but their names are carved into the walls of the monument. The figure for the missing differs from authority to authority, so I cite the data from the Commonwealth Graves Commission. 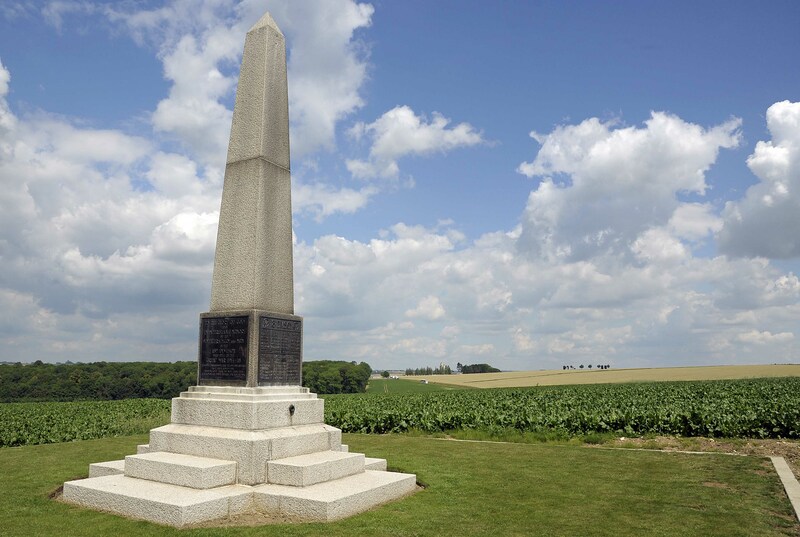 The memorial is built roughly on the site of the old Thiepval Chateau that was pulverized during the battle. A slight hitch developed when I ran into some commemorations at Thiepval Memorial which necessitated leaving the car on the side of the road. 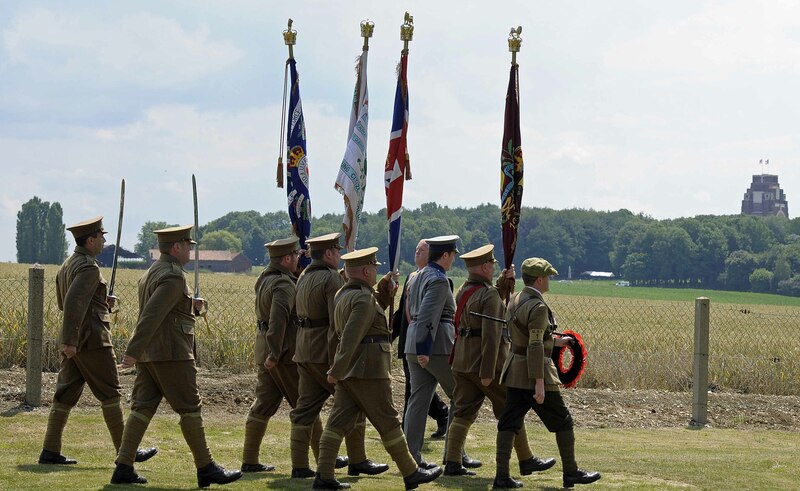 The commemorations are an annual event organized by the Royal British Legion to mark the anniversary of the first day of the Battle of the Somme. Lots of people of different nationalities had turned out to see the bands and observe the ceremonies. Afterwards, many leave their own tributes to the fallen at the memorial. 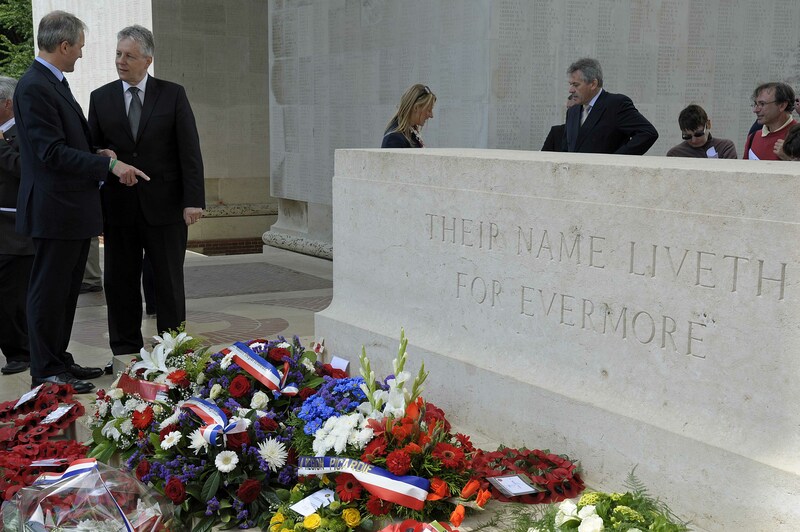 It was interesting to run into some politicians at Thiepval, including Peter Robinson (First Minister of Northern Ireland) and Owen Paterson (Northern Ireland Secretary – UK Government). Lots of military representatives laid wreaths, including the Bundeswehr (German Army). So far I had been driving. Now it was time to walk down from Thiepval to the Ulster Tower, which is about a kilometer away. I started from beside the memorial to the 18th (Eastern) Division on the D151 road. Looking across the valley you can see Thiepval Wood (also known as Authuille Wood) to the left and the Ulster Tower to the middle right. Mill Road cemetery is to the right of the Ulster Tower and Connaught cemetery can just be seen at the edge of Thiepval Wood. In 1916, the British front line ran along the edge of Thiepval Wood. The Ulster Tower is positioned close to a point in the German front line known as the “Pope’s Nose”, and Mill Road cemetery is close to a German fortification called the Schwaben Redoubt. On the way to the Ulster Tower I diverted to walk up to Mill Road cemetery. The view back to Thiepval shows that the German positions supported each other. The British could attach Thiepval and be fired upon from the flank from the Schwaben Reboubt while the reverse is also true. The Commonwealth Graves Commission (CWGC) does an excellent job of maintaining its graveyards, but what makes these places special is the unique stories that you run into time after time. Of course, every one of the gravestones tells its own stories but there are some that are a little different. 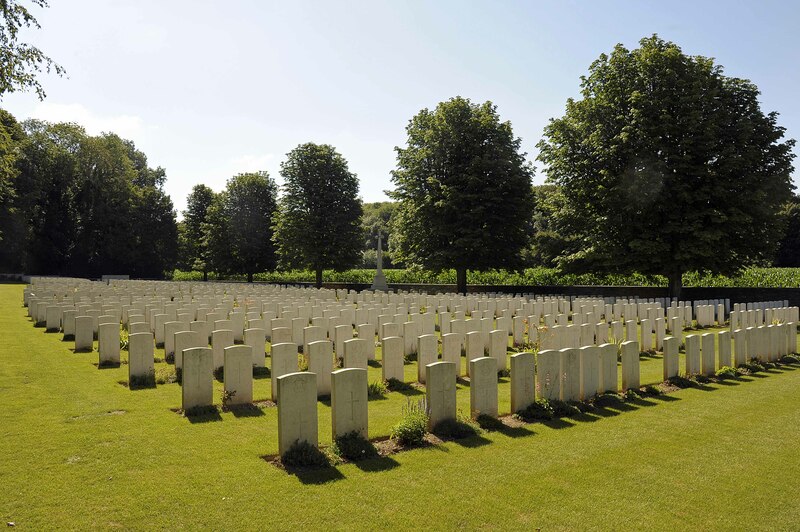 In the case of Mill Road, many of the tombstones are laid flat on the ground because of the large number of tunnels and dugouts from the old German trench system that are in the area. I found the gravestone of 2nd Lieutenant E.W. Lee of the West Yorkshire Regiment, killed on 28 Sept 1916. The relatives of Lieutenant Lee had placed a nice photo of him at the base of the tombstone and wedged it down with a rock and a poppy cross. 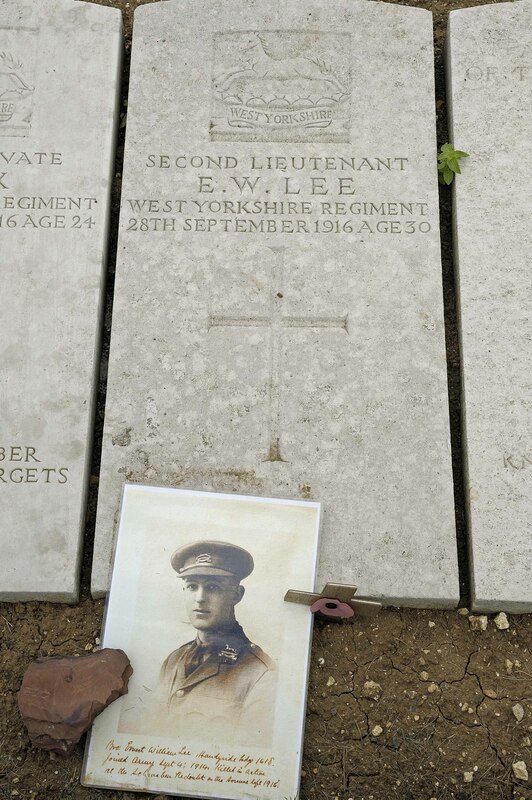 Lieutenant Lee was killed during one of the many assaults that the British launched on Thiepval and its surrounding fortifications after July 1. Although the 36th Division made an amazing attack on July 1 to seize much of the German front and second lines, including capturing the Schwaben Redoubt, reinforcements could not get to them due to the criss-cross of machine gun fire from all sides and the British did not capture the Schwaben Redoubt finally until 14 October 1916 when a combined attack by the 18th and 39th Divisions succeeded. Apart from the way that woods dot the landscape, another unmissable characteristic about the Somme battlefield that really strikes home when you walk is how the land rises and falls. While some pictures make the battlefield look reasonably flat there are a mass of hollows and dips. The Germans held the vast majority of the high ground and while there’s no mountains or cliffs for attacking troops to scale, the distances of a couple of hundred yards between the front line was often made a lot more challenging by the slope of the ground. For example, heading down the hill from the Thiepval Memorial to the Ulster Tower there’s a reasonably small fall of 15m over roughly a kilometer. Think of this line as roughly equivalent to the German front line on July 1. But head down Mill Road from the Ulster Tower towards the Ancre Valley and the ground drops more steeply from 130m to 70m in another kilometer and this is the ground that the British troops advanced across. Attacking across shell-holed ground into wire-protected lines protected by machine guns was never going to be easy. Add a slope and the task gets a lot more physically demanding. It also makes communication much harder for the runners who relayed news back to headquarters and creates horizon lines that highlight soldiers crossing from one side to the other and make them easier targets. After walking the area my respect for the men of the 36th Division who attacked from Thiepval Woods across Mill Road on July 1 increased enormously. 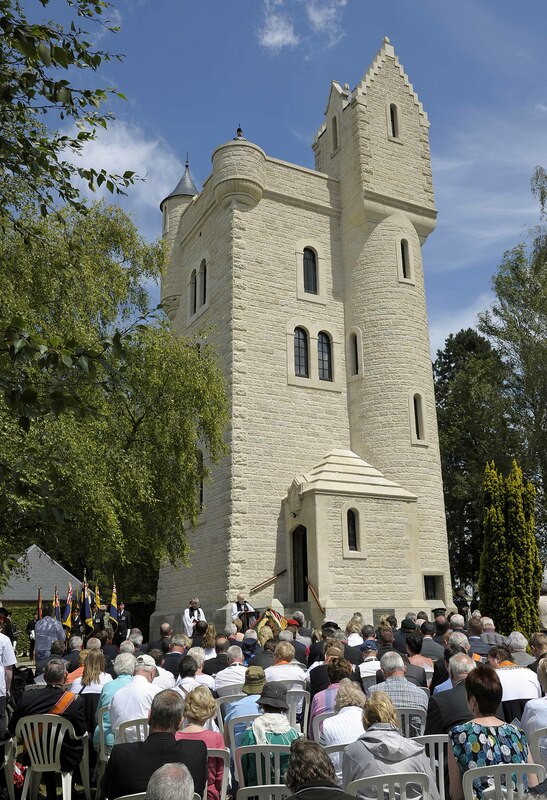 The Ulster Tower (built in 1921) hosted a ceremony to remember the fallen of the 36th Division. Although the men of the 36th were largely drawn from the Protestant community in Ireland, it was good to see that communities from all parts of Ireland were represented at the ceremony. 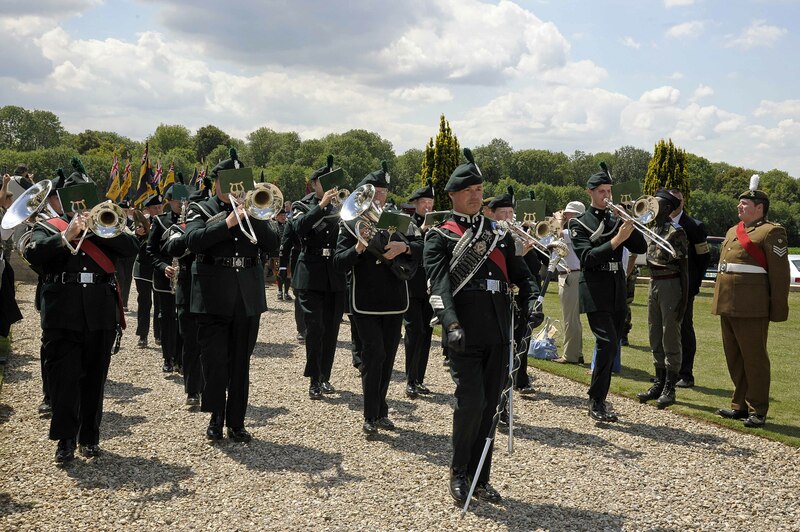 The band of the Royal Irish Regiment (RIR) played as did a band from Belfast dressed in the khaki uniforms worn by the British Army in World War I. The formal ceremony ended with laying of wreaths by politicians (U.K., Irish, and French), the military, and other organizations and was then brought to a close with the “Last Post” played by an RIR bugler and the affirmation by the crowd of the words by the First World War poet Laurence Binyon that “We will remember them”. Because the day was so busy, the people who run the Ulster Tower weren’t offering tours of Thiepval Wood where they have restored trenches and other fortifications to the state they were in July 1916. The wood is now private property and can be dangerous due to unexploded munitions. 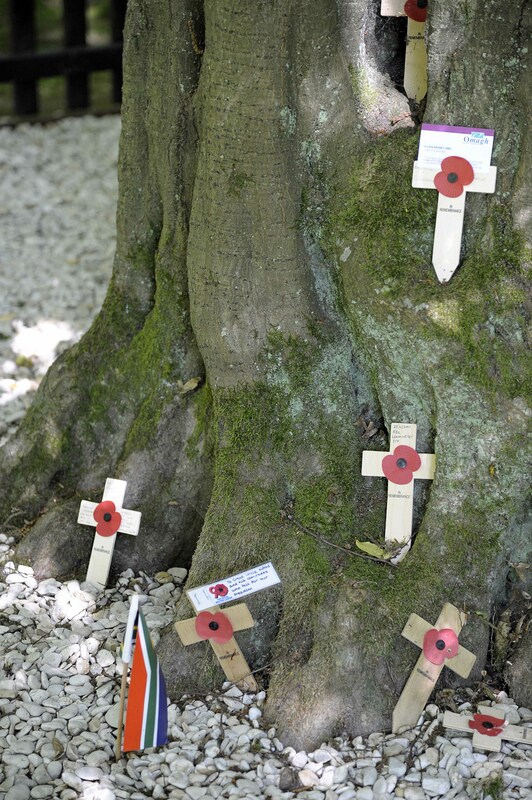 Tours can be booked at the Ulster Tower and the entrance to the wood is by the side of Connaught cemetery. Moving on, I walked back to my car and drove to the Newfoundland Memorial at Beaumont-Hamel. This 74-acre site was bought by the people of Newfoundland in 1921 to commemorate the sacrifice of the Newfoundland Regiment on July 1, 1916. The ground has largely been preserved since that time and includes the remnants of trenches (some protected by pathways laid in the trenches) and the shellholed ground that the Newfoundland Regiment attacked across into ferocious German machine-gun fire with predictable consequences. It really is a sobering experience to look at the ground that the Newfoundlanders advanced over and realize that they must have looked to the Germans like so many sitting ducks. 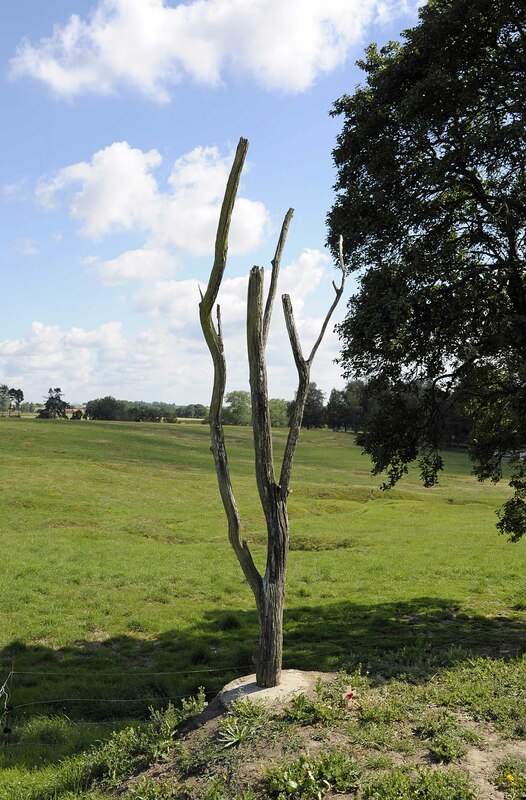 Most of the troops reached no further than the Danger Tree, a landmark in No-Mans Land. All of the 22 officers and 656 of the 758 other ranks that advanced became casualties. Some say that their sacrifice assisted the attack of the 36th Division because the Newfoundlanders had not advanced, the Germans would have been able to fire on the 36th from their flank. Whatever happened, the net result was a disaster. The walk around the Newfoundland Memorial takes some time because there’s a fair amount of ground to cover if you want to look at the trenches, see the famous “Y-Ravine” that the Germans used both as a strongpoint and a communications route to their rear, and visit the various memorials to different divisions that are dotted around the area. 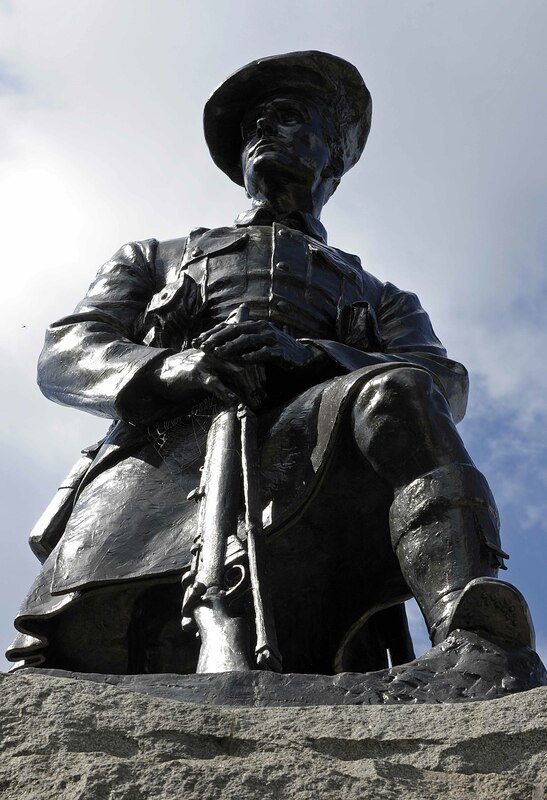 The memorial to the 51th (Highland) Division contains a Scots Gaelic inscription. My knowledge of Irish Gaelic allowed me to understand some of the words, which I later found out to mean “Friends are good on the day of battle”. Time was running out. On the way back to Peronne I had time to pay quick visits to two other locations. 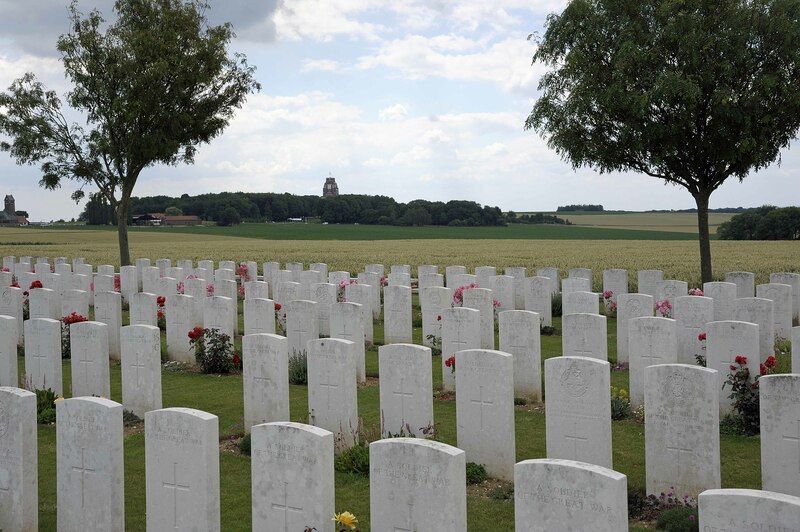 The first was Blighty Valley cemetery, which lies off the road from Authuille to Albert. Most CWGC cemeteries in the Somme are positioned by the roadside but you have to walk in to some like Mill Road and Blighty Valley. Blighty Valley lies south of the Liepzig Salient, part of the defences of Thiepval. Because it is surrounded by fields of crops and reasonably far from the noise of the road, it is a very peaceful location. My last stop was at the Lochnagar crater near the village of La Boisselle, just off the main Albert-Bapaume road. 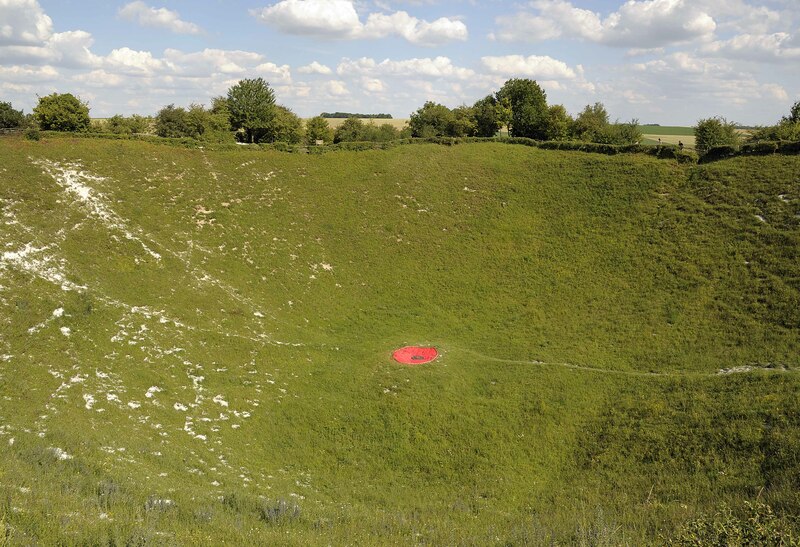 The crater is the result of exploding a mine of some 60,000 pounds of ammonal in an attempt to demolish part of the German front line and create a natural fortress for the advancing British troops to defend. The crater is over 300 feet across and about 90 feet deep and is dangerous because of the erosion of the sides of the crater. 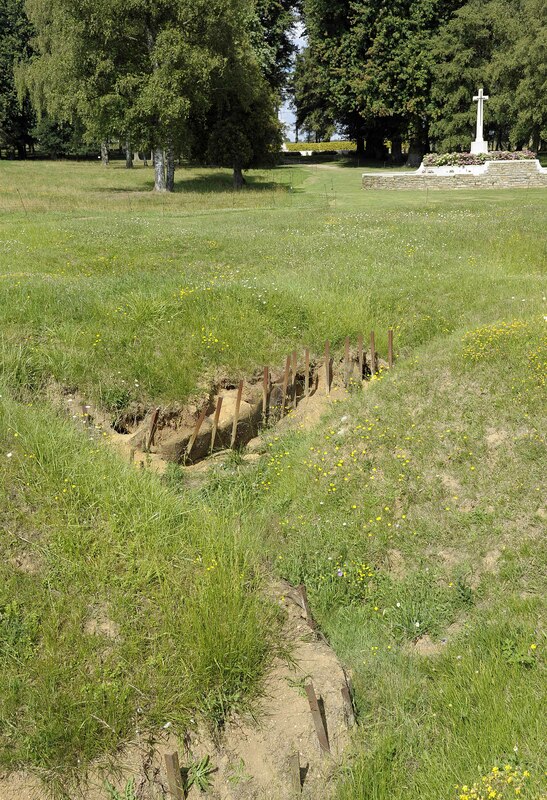 Two mines were detonated near La Boisselle but neither had the desired effect and the British only captured a small part of the village on July 1. I returned to the Hotel St-Claude in Peronne after a long but very interesting day. The Somme battlefields are full of places where you can wander and spend hours realizing the folly of men charging up hills into machine-gun fire and wonder at the sheer bravery of those who did it. A reading of any of the books that I have mentioned will convince you that there is plenty more to see and learn from, so I am already looking forward to my next visit. P.S. for those who are interested, I used a Nikon D700 with a 24-120 lens to take all the photos. This entry was posted in Travel and tagged 1916, Somme, Thiepval, Ulster Tower, Verdun, World War I. Bookmark the permalink. Thank you Tony, a moving diary of a trip I wish I could make one of these days. The picture of 2nd Lieutenant Lee shows that his family remembers, and so should we. That’s a fascinating story Tony. My grandfather told me the story of how he was shot in the Somme. He’d lied about his age and joined just under 17. Then on his 18th birthday when he was finally actually qualified to be there he was shot in the back, fell down a shell hole and couldn’t move. When the stretcher party came along later, a couple of soldiers looked down the hole and told the accompanying officer on horseback that he couldn’t be saved. The officer looked down in turn and said “isn’t that young Wagstaff who works on our estate?” and ordered him to be pulled out. He was eventually sorted out and sent home to be honourably discharged, and lived to be just over 90, and still suffering back problems. In the early days of the war they had more regionally based regiments so it was possible for a land-owning young gentleman officer to be serving alongside the guys who worked for the estate.